If elegance is your tagline, this venue exemplifies it perfectly. Imagine driving up to the drive way , where a valet awaits you. As soon as you get out of your car, you are escorted inside a spacious minimalistic lobby and through the lift down to a plush hall with an attached lush garden. One look at the place and you are mesmerised. And all of this comes to life at Maverick. Because Maverick is the latest place to join the bandwagon of venues, it is made artistically with a very fresh take on interiors. The vibe of the place captivates you. There’s a very classy bar at one end of the hall with a door that opens to the lawn. The other end of the hall is dedicated to the stage with a whole side dedicated to food set up. Maverick has been thoroughly planned, the segregation of space of all the afore-mentioned corners gives it the feel of massive venue. That’s one thing that lacks in 5 star hotels – segregation of space. What an amalgamation! 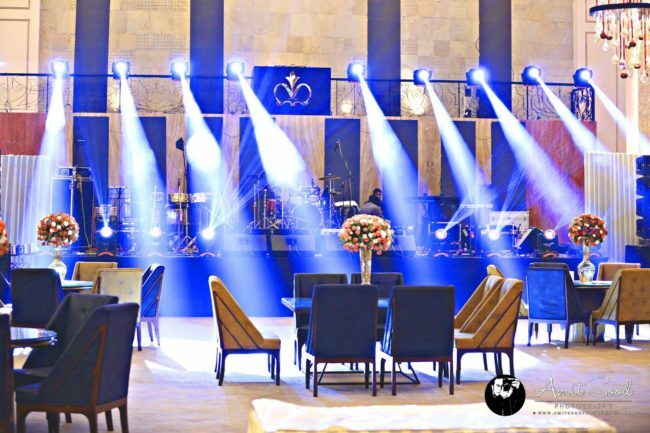 The colorful yet classy interiors, warm rustic colors, regal furniture give it a very upbeat vibe, very different from the traditional vibe other venues offer. The venue is fully air conditioned making it perfect for summer and monsoon weddings without having to worry about the weather. The addition of the lawn makes Maverick favorable for day functions and winter weddings. This place combines the best of all worlds for you. While a lot of venues provide a standardized stage space, Maverick grabs the brownie points with its unique elevated stage space apart from the normal stage space. This can be used as a prop for a gig too! Just look at the grandeur of the place! 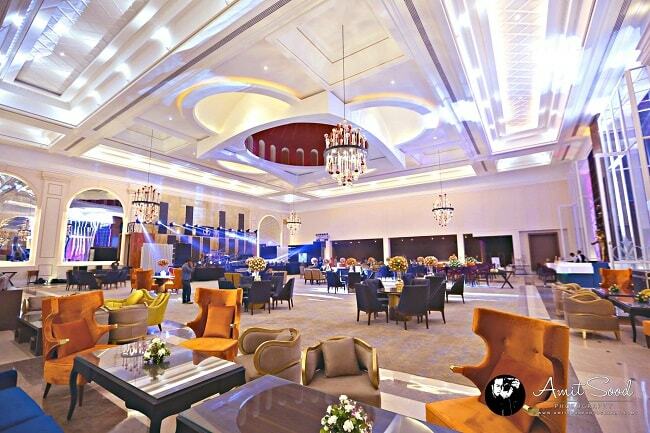 The state-of-the-art hall is made keeping in mind all kinds of celebrations. 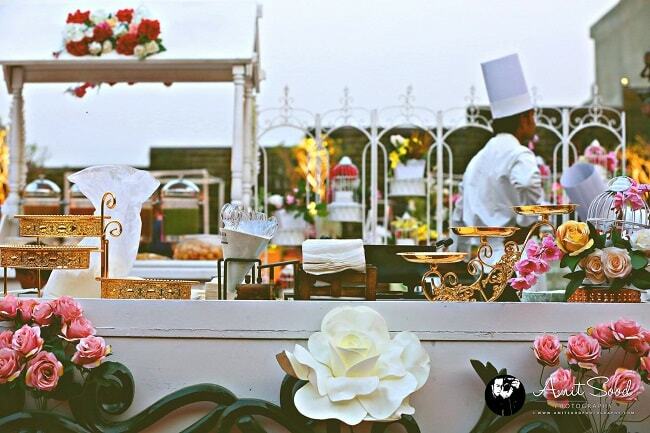 While a typical wedding requires a certain kind of floral decor , occasions like engagement, cocktail, reception, birthday have different decor requirements. The best part about Maverick is its multi-faceted interiors which make it perfect for all occasions even when you don’t really play around with the decor. If you’re all about chic and style, Maverick is your go-to venue, offering plush luxury interiors that will keep you guests in utmost comfort. This gorgeous state-of-the art contemporary hall with its luscious lawn can accommodate a gathering of 250-700 people. Not just weddings, this place is perfect for pre-wedding functions ( engagement, cocktail ), anniversaries, birthdays and other milestone celebrations. 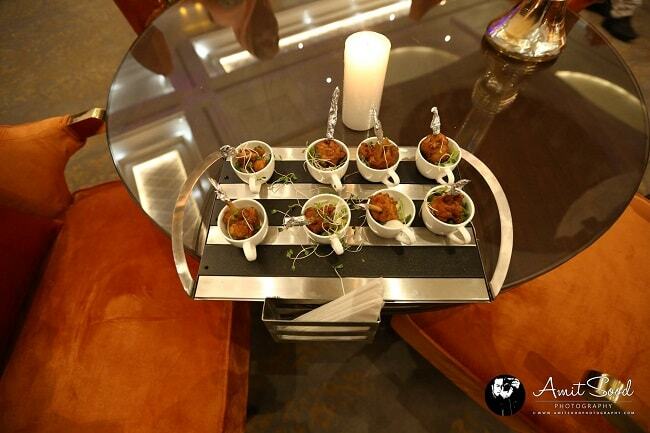 Food has to be of utmost importance, when it comes to a wedding or any celebration in Punjab. Maverick offers a plethora of multi-cuisine dishes which by the way are extremely mouth-watering. They even have specialized street food live counters brought in all the way from Delhi serving Mattar Kulcha, Kachori , Bedmi Poori, et al. Our favorites are Dimsums, Tapas, Cilantro Chicken, Hakka Chilly Soy, Spinach and Ricotta Cannelloni , Tiramisu and everything Indian on their menu. Yes, thats how extensive their menu is! Maverick has been designed very innovatively, keeping all the wedding trends in mind. Bridal and visitor entrances are quite a hit these days and Maverick has two entrances. One entrance, mostly for the guests (leading from the drive way) resembles a hotel lobby with access to valet and lifts leading to the hall. The other entrance allows you to play with decor, maybe putting up a photo booth for fun and having pictures of the couple as a part of the entrance. There are a million things that can be done at the entrance. Maverick provides the decorators with a lot of space to innovate. Doesn’t the place sound like a dream for any events team? Nearly away from the city’s hustle-bustle yet not too far, Maverick is located on Pakhowal Road, opposite Omaxe residency making it an easily approachable venue.